I used to make this with a jar of Tomatillo Salsa, but checked the label and realized there is added cane sugar. 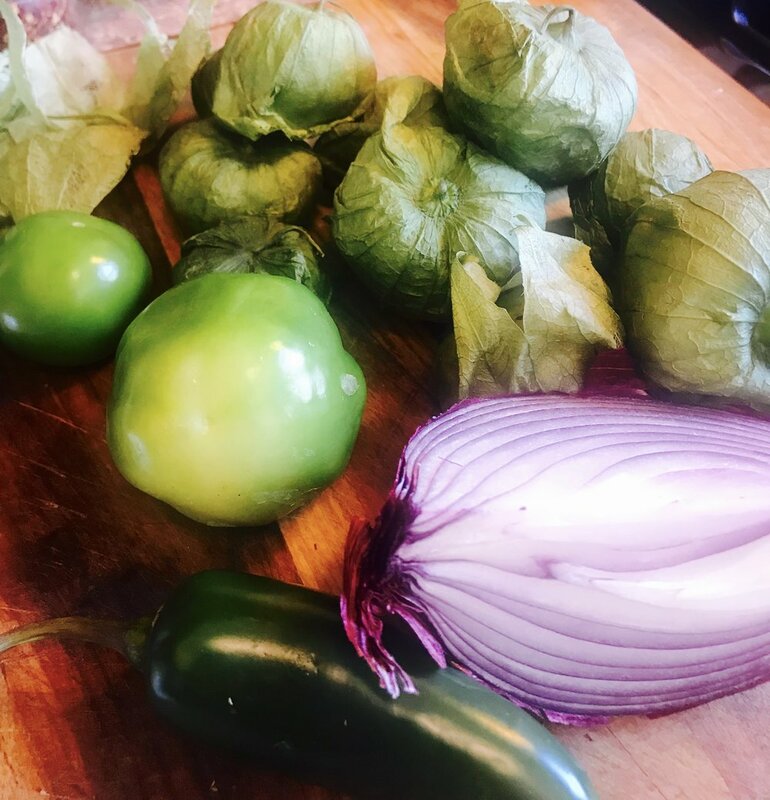 Since I’m doing a Whole Life Challenge for 6 weeks that recommends I eliminate sugar, I decided to make a quick tomatillo salsa from scratch instead. It is super easy and actually better than the one from the jar. Place chicken thighs in a large pot with 2 teaspoons salt and cover with 5 cups water. Bring to a boil over medium high heat, reduce to a simmer and cook until done, about 30 minutes. Use tongs or a slotted spoon to remove thighs from liquid. Place on a plate or tray and let cool. Please note: If your chicken cooking liquid appears “shmutzy”, just pour through a strainer and return to pot. Note: For a recipe shortcut, substitute shredded rotisserie chicken and 2 cups low sodium chicken broth instead of braising the chicken thighs in water. Place tomatillos, jalapeno and onions on a baking sheet. Broil until vegetables are charred and softened, about 8-10 minutes per side, depending on the power of your broiler. (There should be dark char marks so don’t be worried about burning them). Remove from oven and transfer ingredients to a food processor or blender with 1 teaspoon salt. Puree until almost smooth, then pour into chicken cooking liquid. When cool enough to handle, shred the meat into bite-sized pieces. Add chicken and beans to the cooking liquid. Bring mixture to a simmer over medium heat, and cook for 5 minutes. Remove from heat, stir in lime juice and season to taste with salt and pepper. Spoon into bowls and serve topped with cilantro leaves, chopped jalapeños, toasted pepitas, diced avocado and sliced scallions. Add a dollop of yogurt if you like. 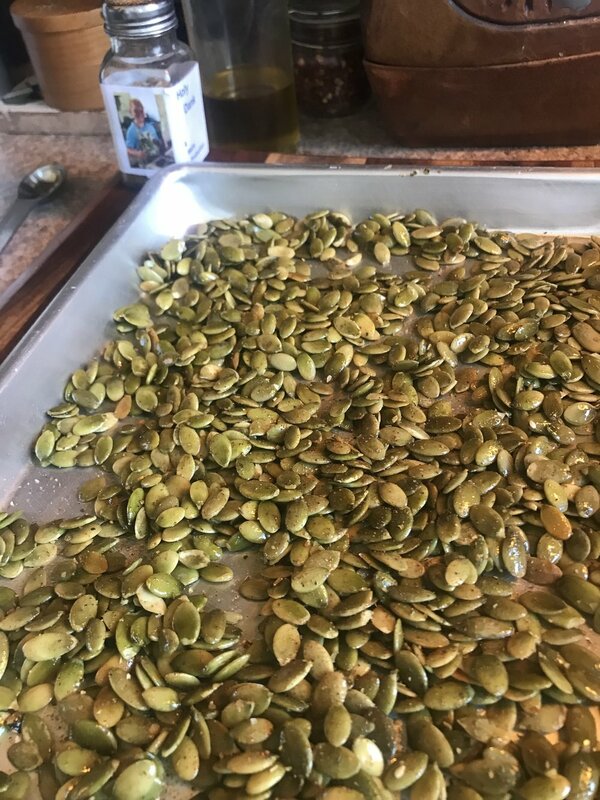 Preheat oven to 375 degrees F. Arrange pepitas in a single layer on a baking sheet and toss with olive oil, seasoning blend and a pinch of salt. Toast for 10 minutes, stir and toast another 8-10 minutes or until golden. Season with more salt if needed.